We made some etched mirrors on Tuesday at family night at the church. I cut out stencils with my cricut and design studio software. Each of the girls made their own mirrors, I cut out the same stencils for each girl and they all looked VERY different. I made this one for Tiki - she couldn't make it on Tuesday. I hope she likes it! Each mirror had the Young women theme this year "Be thou an example" along with their names cut out with the Tear Drop font cartridge. Each of the other stencils were cut out with Accent essentials and Storybook cartridges. 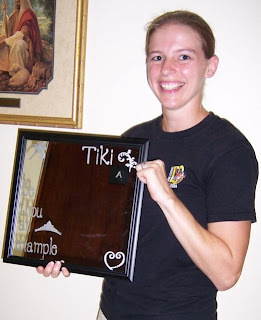 I have an extra mirror and frame to make one for Abby - any suggestions? I was thinking "I'm a princess" But Ryan said NO to that one. So - monkeys? Flowers? hearts? HELP! So cute! Hmmm how about the Sugar and spice and everything nice that's what little girls are made of going around the outer edge? What a GREAT idea, I love how it turned out! !